(OPRAH.com) -- A man from Vermont got into the habit of leaving his wife little notes. Nothing elaborate -- just sweet sentiments like "I love you" or "I can't wait to get home to you tonight," jotted down on Post-it notes and then hidden in places where he knew she'd stumble over them throughout the course of her day. You can say "I love you" by giving your time and attention to people in need. She'd open a drawer or reach into a kitchen cabinet and find a hidden note. From inside the dog food bin, to the laundry hamper, to the driver's seat of her car, the notes were everywhere. He was in the military and he was shipped out during the early days of the war in Iraq, where he was killed in action. On the morning of the funeral, his young widow put on her winter coat, placed her hands in her pockets, and found the last two notes which he had hidden there for her before he had left home. Knowing exactly what they were, she slowly pulled them out of her pockets. The first one read, "I will always love you." And the other read, "We will always be together." Did he know the circumstances under which she'd find them? It was hard to say. You can imagine the sorrow she felt as she read them, but think how lucky she was to have had a husband who managed to reach out with a final, loving gesture. Like this wonderful man, all of us can create ways everyday that say, "I love you." I know it's almost Valentine's Day, and we have come to think of only this day as LOVE day but instead, I am suggesting that we think of EVERY DAY as an opportunity to put a little love in the world. There is an old saying that goes something like this, "Love doesn't make the world go round, but it sure makes the ride worth while." You see, real joy and true happiness are found when we tell someone we care and show them how special they are in our lives. Oprah.com: Gifts your sweetheart will love! I am talking about the kind of love where a woman gives her birthday bouquet away to a co- worker because the co-worker has had some rough financial times and can not afford to purchase a gift for her niece. The woman believes her birthday bouquet will be even more special when the co-worker gives it to her niece. Or, when everyone at a hair salon contributes to making a quilt for their friend who has just been diagnosed with ovarian cancer. The quilt was filled with their well wishes and served as their own special way to cover their sick friend with love. An act of love is present when a woman grows out her red silky hair, just so that it could be pulled back in a pony tail and cut to be donated to Locks of Love, a company that makes beautiful wigs for women who have lost their hair to chemotherapy treatments as they battle cancer. Love is also found within a retired woman who decides to raise money so she can go to Africa where she can best tend to and take care of orphaned children who are affected by HIV and AIDS. We all know stories like these and we each have our own stories to tell, to inspire us and remind us what really matters. It is in these acts of kindness where the joy of living is found. These acts of love are everywhere, and when we turn our eyes and hearts to them, they touch and change our lives forever. Defining what love is has been the work of poets and philosophers throughout time, but it's our job too. It is something we all know when we feel it, but words simply are not adequate enough to define it. 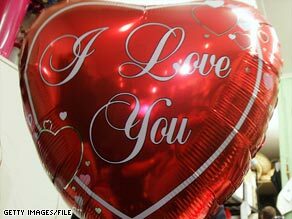 This Valentine's Day, remember that there are so many ways to say, "I love you." Be a mentor. Teach someone to read. Sit a while with someone who is lonely. Volunteer. Serve food at a shelter. Make art with kids. Compliment someone. Listen to what someone has to say. Visit a friend who is sick. Wave to the women sitting in the window at a nursing home. Tell someone you are thinking about them. Be a role model. Work to build a house with Habitat for Humanity. Lend a hand at the local fire hall. Use your money generously. Walk for what you believe in -- peace, breast cancer research and life. Comfort someone when they are sad. Walk your neighbor's dog. Participate in a food drive. Bake or buy something from a bake sale. Donate the clothes you do not wear from your closet, and you will have loved with all of your heart.